Schedule: 2x / week, 60–75 min. First, read the available course descriptions, noting prerequisites, target grades, and course objectives. If you think your student is prepared for the course, go ahead and register. After registration, a placement assessment may be provided to students, depending on the course and the student’s previous enrollment with Scholé Academy. Parents are encouraged to connect with the Assistant to the Principal and/or with the course instructor to make the best enrollment decision for their student. Registration is not finalized until the student’s placement assessment has been returned by the course instructor with placement confirmation. There is a $75 deposit built into the cost of each course. If a placement evaluation has not been administered, withdrawals requested before May 1 are granted a full refund, including the full $75 deposit. If a placement evaluation has been administered, withdrawals requested before May 1 are granted part of their $75 refund: $35 will be paid to the instructor for the placement evaluation, and the remaining $40 of the original deposit will be refunded. After May 1, withdrawals are granted a full course refund, less the $75 deposit. Students may withdraw from a course through the second week of classes. After the second week of classes, no refund is given. 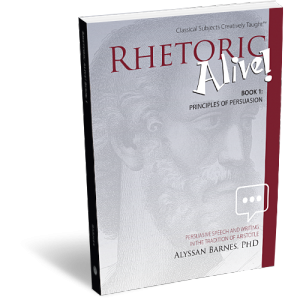 High school students enrolled in this Rhetoric 1 course will study and practice the art of rhetoric: persuasive writing and speaking. Using Rhetoric Alive! Book 1—which explores the principles of winsome speech as developed by Aristotle—the course guides students through a study of the theory and application of the essential components of persuasion: the 3 appeals, the 3 types of speech, and the 5 canons of rhetoric (see below). Along the way, students encounter, discuss, and analyze classic examples of rhetoric, spanning from Pericles’s “Funeral Oration” to Martin Luther King Jr.’s “Letter from Birmingham Jail.” Students also develop their own rhetorical skill through workshops, imitation assignments, and oratory presentations. This course equips students to speak and write persuasively with wisdom and eloquence. Placement: Please read about our new process above. Incoming students should have a working knowledge and familiarity with the informal fallacies (a good preparation would be Scholé Academy’s Informal Logic course or The Art of Argument text), and an ability to apply the principles of formal argument construction (along the lines of Scholé Academy’s Formal Logic course or The Discovery of Deduction text). Students who have additionally completed Scholé Academy’s Persuasive Writing course or The Argument Builder text are also well prepared to embark on this journey into Rhetoric 1. Students should also be familiar with professional writing standards and adhere to MLA formatting guidelines for all written submissions in Rhetoric 1. MLA style is widely accepted for college students, and mastery of a style (like MLA) is essential for college-bound students. High School Credit: This course is the equivalent of one high school credit in speech and debate, composition, or language arts. At Scholé Academy, we have carefully considered how we should engage our contemporary culture as those who believe that Christ is the Truth (John 14:6), and that all truth has its source in him. We think it is important to provide our upper school students (in grades 7-12) with tools and opportunities for critically examining various cultural trends, issues and mores through the lens of orthodox, Christian beliefs. Being confident in the truth revealed to us in creation, the Scriptures, and the tradition of the church, we are not afraid to follow the truth and its implications nor to address error and falsehood. … Read more about our Faith & Culture. *Required texts are not included in the purchase of the course. Computer: You will need a stable, reliable computer, running with a processor with a speed of 1 GHz or better on one of the following operating systems: Mac OS X with Mac OS 10.7 or later; Windows 8, 7, Vista (with SP1 or later), or XP (with SP3 or later). We do not recommend using an iPad or other tablet for joining classes. An inexpensive laptop or netbook would be much better solutions, as they enable you to plug an Ethernet cable directly into your computer. Please note that Chromebooks are allowed but not preferred, as they do not support certain features of the Zoom video conference software such as breakout sessions and annotation, which may be used by our teachers for class activities. High-Speed Internet Connection: You will also need access to high-speed Internet, preferably accessible via Ethernet cable right into your computer. Using Wi-Fi may work, but will not guarantee you the optimal use of your bandwidth. The faster your Internet, the better. We recommend using a connection with a download/upload speed of 5/1 Mbps or better. You can test your Internet connection here. Click to download the first option listed, Zoom Client for Meetings. Open and run the installer on your computer. In August, students will be provided with instructions and a link for joining their particular class. First, read the available course descriptions, noting prerequisites, target grades, and course objectives. If you think your student is prepared for the course, go ahead and register. After registration, a placement assessment may be provided to students, depending on the course and the student’s previous enrollment with Scholé Academy. Registration is finalized when the student’s placement assessment has been returned by the course instructor with placement confirmation. Please take careful note of our teaching philosophy, our technology requirements, our school policies, the parent agreement, and the distinctions between our grade levels. Double-check the course section dates and times. Make sure they don't conflict with other activities in your schedule or other courses you are purchasing. Our system will not catch double-bookings! You're ready to add course selections to your cart! Our Assistant to the Principal will be in touch with you after your enrollment to help you with next steps, including any placement evaluations that may be required for your course selections. This registration will be finalized when the student's placement assessment has been returned by the course instructor with placement confirmation. Scholé Academy seeks to provide superlative classical education online, employing the restful pedagogy embodied in the word scholé.